Detroit may have filed for bankruptcy but it's still a city rich in history, architecture, and innovation. See which buildings have been restored and which await renewal on this Detroit tour led by a passionate and proud local. Begin your Detroit tour at a cafe on Broadway, where you'll meet your local guide and head out onto the streets. 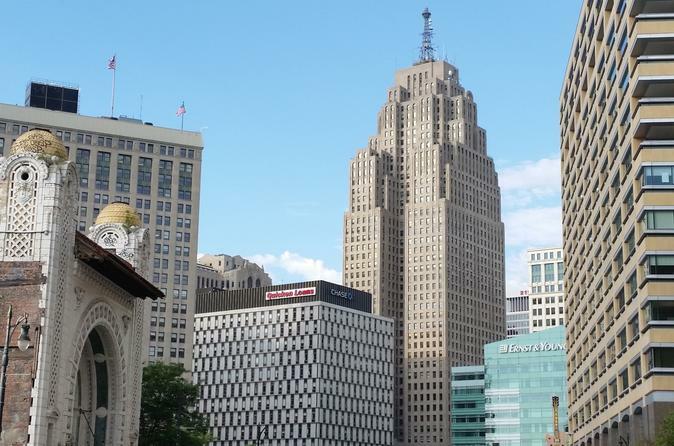 From the minute you leave the meeting point, you'll start seeing some famous Detroit landmarks, such as the 95-year old Detroit Athletic Club, the renovated Opera House, the vacant Wurlitzer Building, and the fine new downtown YMCA. Your local guide will be telling you all you need to know about these spots, and what they mean to the city of Detroit. Continuing on your tour in Detroit, see the site where one of the biggest department stores in the US once stood. When it closed in the 1980s, it left a hole in the city that hasn't been filled. Next on this Detroit city tour, the Compuware Building is worth a visit for its 15-story atrium and colorful fountain. Outside that building, you'll see a panorama that includes landmarks like the 47-story Penobscot Building, the Guardian Building, and the Renaissance Center, which is home to the tallest hotel in the entire Western Hemisphere (72 floors!) as well as the headquarters of General Motors. A visit to the Guardian Building gives you a picture of the greatness of Detroit in the late 1920s. You'll take a stop here, and then take a ride on the elevated People Mover, which has been moving people around downtown Detroit since 1987. From the Michigan Avenue Station, see the $800 Million MGM Grand Casino and hotel that were completed in 2008, and the new Rosa Parks Transit Center (named for "the mother of the Civil Rights Movement") with its dramatic canopies. If the weather is nice, you'll walk to a nearby hotel that's a great example of Detroit's rise, fall and renewal. When it opened in 1924 it was the tallest hotel in the world and one of the fanciest, but it closed in the 1980s and stood vacant for more than 25 years on a prominent street corner. Detroiters were thrilled when it reopened after a $200 million renovation! Next, you'll visit the area near Grand Circus Park, which is full of examples of Detroit's rocky history. Here, you'll find even more vacant buildings as well as legendary parks and music venues that have hosted the like of Bruce Spingsteen and Detroit's own Eminem. It's one thing simply seeing these buildings, but to get to know the history behind them makes the experience even more special, especially when it comes from the mouth of a local! Your last stop is a local brewpub, where you can sip on a local beer or soft drink and continue to chat about Detroit with your local guide. The first drink's on us!